Benchmark is a theatre company created by YMCA St Paul’s Group residents, staff, volunteers and community members. The company meets every Thursday at YMCA Surbiton. 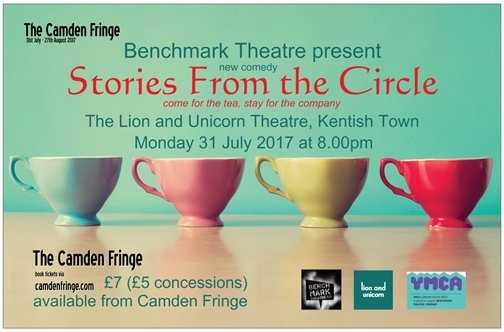 Back at the Camden Fringe Festival for a second year on Monday 31 July, Stories from the Circle is a devised comedy by Benchmark. Following the recent ad in the Kentish Town Weekly, Brenda and Lilly are surprised to see a large number of new faces at the support group. The audience are taken on a journey through the, at times somewhat unusual, issues that face the group. As the stories come to life throughout the play, the audience cannot help but get drawn in to the action. This play has been performed twice before, each time including different characters, making it always original.